This commode's serpentine bombé form, with its crisp, angled sides and inlaid rosette decoration, is typical of Neopolitan furniture. A commode with similar marquetry in the Museo Correale di Terranova, Sorrento is illustrated in E. Baccheschi, Mobili Italiani del Meridione, Milan, 1966, p. 85, while a further example in the same museum is illustrated in A.P. Murano, Il Mobile Napoletano del Settecento, Naples, 1977, pl. XXV.a. 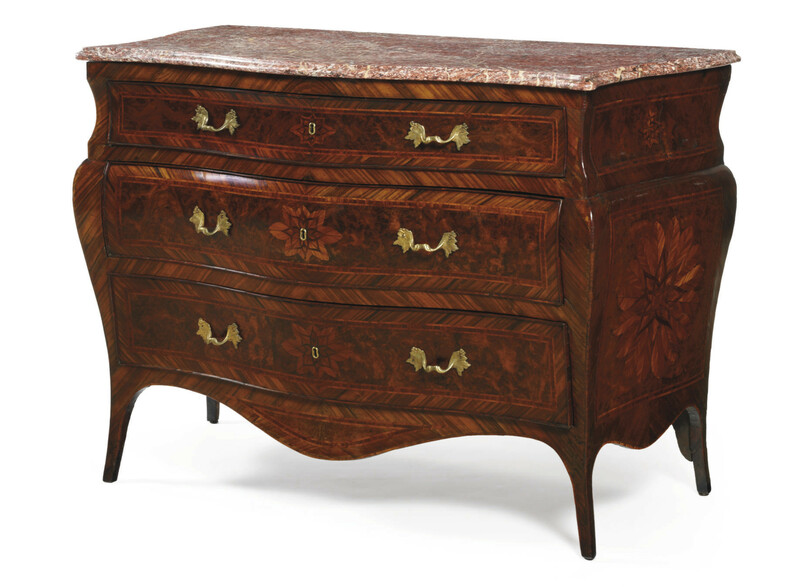 A related commode was sold anonymously at Christie's New York, 18 October 2002, lot 55, and another at Christie's London, 14 December 1995, lot 88.